Nintendo Power 1996: The Hype of Ocarina of Time Begins? Our Zelda Publications page has been updated with the 1996 issues of Nintendo Power. When you think of the year 1996 in terms of Nintendo and Zelda, what are the first things that come to mind? What obviously pops to my mind when I think Nintendo in that year is the release of the Nintendo 64. This marked the transition from the 16-bit Super Nintendo to the three dimensional Nintendo 64. Starting with Nintendo’s gaming trade-show Spaceworld in November 1995, the Nintendo 64 was shown to a widespread audience. It was the January 1996 issue of Nintendo Power that saw full coverage of Spaceworld, including the very first looks of Zelda 64, what would later become known as Ocarina of Time. Yet as the year went on, it wasn’t Zelda 64 that stole the spotlight in the Zelda world, but rather, it was still the lingering legacy of both Link’s Awakening and A Link to the Past. Throughout the year Link’s Awakening was still frequently featured in both the Counselor’s Corner and within the Classified Information section, with all such appearances linked to below. It’s quite amazing that after nearly three years of being released, the game was still at the top of the Nintendo Power Game Boy charts and tips and tricks were still being featured. It was even a bit more remarkable in the case of A Link to the Past. It was announced in the March 1996 issue of Nintendo Power that due to popular demand, A Link to the Past was going to undergo another production run. This would be known as the Player’s Choice version of the game and with its re-release, several months of A Link to the Past material was featured. However, Zelda64 still got its share of the spotlight and this truly started the Hype for what would become one of the most anticipated games in video game history. It started with the feature in the January 1996 issue, including an interview with Shigeru Miyamoto, but there were a couple other mentions of the game throughout the year, including another interview with Miyamoto in October of 1996. Even with all that, there was still so much more in 1996 that was Zelda related. Everything from an interactive Zelda fan fiction that got a 4-page feature, to the original Legend of Zelda and The Adventure of Link getting re-featured in the Classic Epics. Toss in some Fan Artwork featured in the Player’s Pulse and the fact that A Link to the Past and Link’s Awakening dominated the charts, it surely was a great year for Zelda in Nintendo Power. Pretty remarkable since Link’s Awakening was over two years old and we were still two years away from the release of Ocarina of Time. What really stood out to me in 1996 was how Zelda stood the test of time. A Link to the Past, five years after its release was getting featured in Nintendo Power. Let’s put that into perspective for today’s age. It hasn’t even been five years since the release of Twilight Princess, but what if it was given the same treatment as A Link to the Past. Can you imagine if the March 2011 issue of Nintendo Power had several pages dedicated exclusively to Twilight Princess? If questions were answered on how to complete certain obstacles in the game? This would be unthinkable to do five years after its release. Heck, for any game that’s not a brand new release it would be unthinkable. This goes to show how even single player games like Zelda had such strong replay value back then. Yet for most gamers today, games like Twilight Princess or Phantom Hourglass were played just once, never to be touched again. Surely a sign of the times. All the goodies mentioned in the above paragraphs are linked to below. 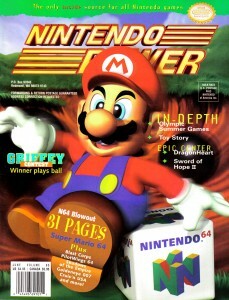 Issue #082 – March 1996 – The game was announced. Issue #083 – April 1996 – Six pages dedicated to A Link to the Past. Issue #084 – May 1996 – An a Link to the Past minimalist heart-run is put in the Arena. Issue #085 – June 1996 – Three questions answered in the Counselor’s Corner. –Issue #080 – January 1996 – Game screen shown, an interview with Shigeru Miyamoto, and more. –Issue #085 – June 1996 – Zelda64 is labeled as the most eagerly awaited sequel of all time. –Issue #089 – October 1996 – Miyamoto talks about Zelda64 in an interview. As usual, your comments are very much appreciated. Would you like to see more of this type of thing? I’m planning on continuing the project, but do you think it is worthy of front-page news? Did you enjoy my commentary and analysis? Anything you’d like to see done differently? Be sure to let me know in the comments below.